Something strange is going on in this town. A quality adventure game with challenging puzzles, oddball characters, and an intriguing, mystery-laden plot. What is it? 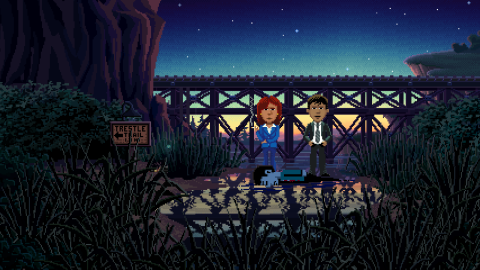 A point-and-click murder mystery. It's a game that dips into the past, but doesn’t use it as a crutch, managing to capture the essence of classic adventures while avoiding some of the things that made them frustrating. I would have liked to see more of a connection between the characters, who never really interact other than to swap items. And sometimes the story gets a little too meta for its own good. But otherwise this is one of the best modern point-and-click adventures on PC.